The small platform 1350lb (612kg) rated operating capacity JCB 135 radial lift skid steer is the smallest model in our revolutionary range. Our unique single boom and side entry design makes this skid steer loader comfortable, safe, economical, productive and tough. Designed and built in the USA (home of the skid steer), the 135’s 48hp (36kW) Kohler engine delivers impressive performance and low operating costs. The 135 has on average 60% better visibility and a 46% larger cab than rival manufacturers’ mini skid steer designs, and there are a whole range of other benefits too. Like ergonomic controls, an extremely tough power boom and a low cost of ownership. Electric controls make handling smooth and intuitive; all in all, we like to think the JCB 135 skid steer loader is a comfortable favorite with operators. There’s no more productive skid steer than the JCB 135. The figures speak for themselves: it has a 16% lower cost of ownership than the top competitor, a better SAE service rating, an annual fuel savings of over 2450 liters* and a heavy-duty crowd ram that’s nearly 3 times the size of the nearest major competition. Side entry makes a JCB skid steer 17% quicker in applications requiring multiple entries and exits, such as some agricultural tasks. So it’s no wonder the JCB 135 small platform skid steer loader is on average 21% more serviceable than competitors’ machines, based on SAE Service Audit Scores. The small platform 1550lb (703kg) rated operating capacity JCB 155 radial lift skid steer incorporates our unique single boom and side entry design. Designed for comfort, safety, economy, productivity and durability in the USA (home of the skid steer), the 155’s potent 56hp (42kW) Kohler engine is tried, tested and proven. Electric controls make handling smooth and intuitive; all in all, we like to think the JCB 155 skid steer is a comfortable favorite with operators. 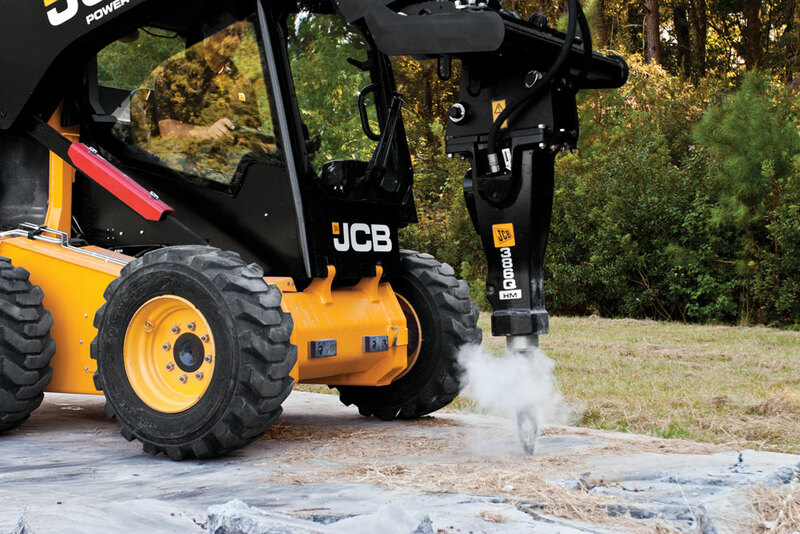 There’s no more productive compact skid steer than the JCB 155. The figures speak for themselves: it has a 16% lower cost of ownership than the top competitor, a better SAE service rating, an annual fuel savings of over 647 gal (2450 liters)* and a heavy-duty crowd ram that’s nearly 3 times the size of the nearest major competition. The JCB 155 skid steer is designed with safety to the fore. Our unique PowerBoom single loader arm design means operators can enter the machine from the side, avoiding slip hazards, crush hazards and contact with the loader arm and its attachments. It’s also got 60% better visibility than the average skid loader, partly due to a low profile single rear loader tower and the absence of a conventional large rear torque tube. There’s a front windshield that doubles as an emergency exit and a standard rear view mirror. Then there’s the fuel tank, integrated into the skid steer’s chassis for added protection; and the hoses, safely run through the PowerBoom to reduce the possibility of damage. The new small platform 1550lb (794kg) rated operating capacity JCB 175 vertical lift skid steer loader incorporates our unique single boom and side entry design. Designed for comfort, safety, economy, productivity and durability in the USA (home of skid steers), the 175’s 56hp (42kW) Kohler engine is tried, tested and proven. Electric controls make handling smooth and intuitive; all in all, we like to think the JCB 175 skid steer is a comfortable favorite with operators. There’s no more productive skid loader than the JCB 175. The figures speak for themselves: it has a 16% lower cost of ownership than the top competitor, a better SAE service rating, an annual fuel savings of over 647 gal (2450 liters)* and a heavy-duty crowd ram that’s nearly 3 times the size of the nearest major competition. The JCB 175 skid steer loader is designed with safety to the fore. Our unique PowerBoom single loader arm design means operators can enter the machine from the side, avoiding slip and crush hazards and contact with the loader arm and its attachments. It’s also got 60% better visibility than other skid steers, partly due to a low profile single rear loader tower and the absence of a conventional large rear torque tube. So it’s no wonder this small platform skid steer is on average 21% more serviceable than competitors’ machines, based on SAE Service Audit Scores. The new small platform 1900lb (862kg) rated operating capacity JCB 190 vertical lift skid steer incorporates our unique single boom and side entry design. Designed for comfort, safety, economy, productivity and durability in the USA (home of skid steer loaders), the 190’s 62hp (46kW) Kohler engine is tried, tested and proven. Electric controls make handling smooth and intuitive; all in all, we like to think that JCB 190 skid steer loaders are a comfortable favorite with operators. There’s no more productive skid loader than the JCB 190. The figures speak for themselves: it has a 16% lower cost of ownership than the top competitor, a better SAE service rating, an annual fuel savings of over 647 gal (2450 liters)* and a heavy-duty crowd ram that’s nearly 3 times the size of the nearest major competition. The JCB 190 skid steer is designed with safety to the fore. Our unique PowerBoom single loader arm design means operators can enter the machine from the side, avoiding slip hazards, crush hazards and contact with the loader arm and its attachments. It’s also got 60% better visibility than average skid steer loaders, partly due to a low profile single rear loader tower and the absence of a conventional large rear torque tube. There’s a front windscreen that doubles as an emergency exit and a standard rear view mirror. Then there’s the fuel tank, integrated into the chassis for added protection; and the hoses, safely run through the PowerBoom to reduce the possibility of damage. So it’s no wonder the JCB 190 small platform skid loader is on average 21% more serviceable than competitors’ machines, based on SAE Service Audit Scores. Keeping your operators fresh, focused and productive is paramount, which is why we’ve designed our 205 model skid steer with a 46% larger cab than the nearest competitive machine. Our standard seat has mechanical suspension and there’s also a 12V charger, easily readable control panels and an electronic hand throttle. Electric controls make handling smooth and intuitive; all in all, we like to think that JCB 205 skid steers are a comfortable favorite with operators. 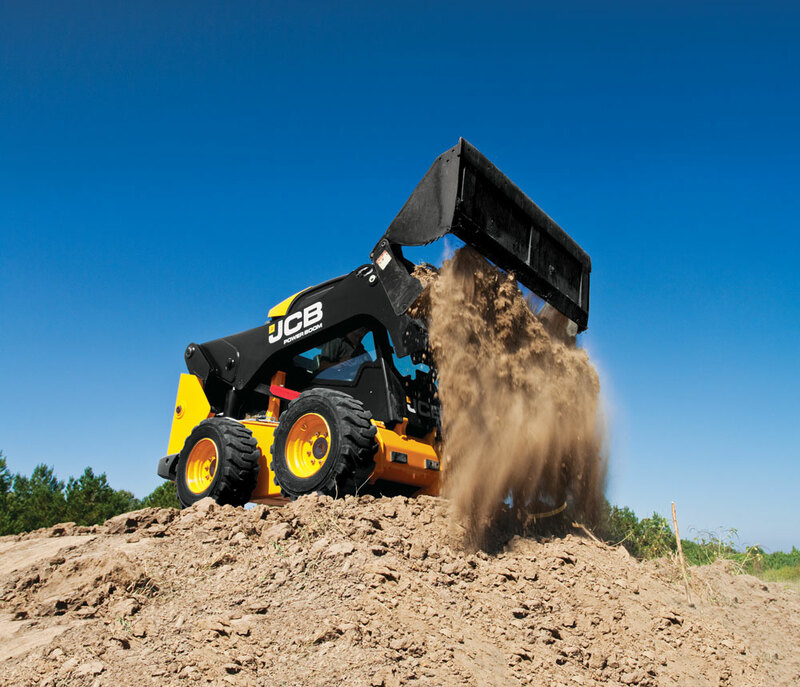 There are no more productive skid steer loaders than the JCB 205. The figures speak for themselves: it has a 16% lower cost of ownership than the top competitor, a better SAE service rating, an annual fuel savings of over 2450 litres* and a heavy-duty crowd ram that’s nearly 3 times the size of the nearest major competition. JCB 205 skid steer loaders are designed with safety to the fore. Our unique PowerBoom single loader arm design means operators can enter the machine from the side, avoiding slip hazards, crush hazards and contact with the loader arm and its attachments. There’s a front windshield that doubles as an emergency exit and a standard rear view mirror. Then there’s the fuel tank, integrated into the chassis for added protection; and the hoses, safely run through the PowerBoom to reduce the possibility of damage. In short, it’s one of the safest skid steer loaders you can buy. The emergency exit on our skid steers is over twice the size of that found in a conventional design. We’ve designed our range of skid steer loaders to be extremely serviceable, ensuring minimum downtime. Firstly, we mount our engines longitudinally for easy access to the drive belt and associated components. There are also 30% fewer grease points than average vertical lift twin arm skid steers. So it’s no wonder our small platform skid steer loaders are on average 21% more serviceable than competitors’ machines, based on SAE Service Audit Scores. And there’s more too. The largest of our skid steer loaders to offer radial lift, the large platform JCB 225 (rated operating capacity of 2250lb (1021kg)) incorporates our unique single boom and side entry design. Designed for comfort, safety, economy, productivity and durability in the USA (home of skid steers), the 225’s 74hp (55kW) JCB EcoMAX engine is durable and hugely efficient. Keeping your operators fresh, focused and productive is paramount, which is why we’ve designed our 225 model of skid steer loaders with a 33% larger cab than the nearest competitive machine. Our standard seat has mechanical suspension and there’s also a 12V charger, easily readable control panels and an electronic hand throttle. 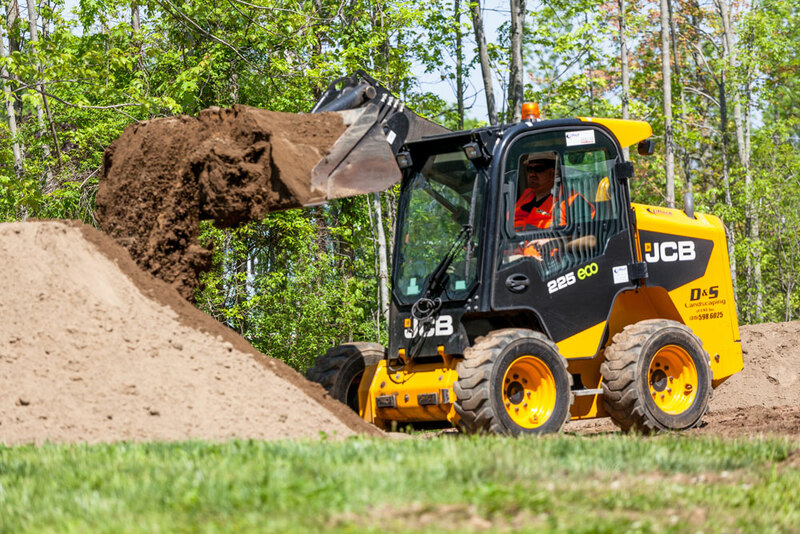 Servo-assisted controls make handling smooth and intuitive; all in all, we like to think that JCB 225 skid steers are a comfortable favorite with operators. There are no more productive skid steer loaders than the JCB 225. The figures speak for themselves: it has a 16% lower cost of ownership than the top competitor, a better SAE service rating, an annual fuel savings of over 3975 liters* and a heavy-duty crowd ram that’s nearly 3 times the size of the nearest major competition. JCB 225 skid steer loaders are designed with safety to the core. Our unique PowerBoom single loader arm design means operators can enter the machine from the side, avoiding slip hazards, crush hazards and contact with the loader arm and its attachments. Large platform JCB 280 (2800lb (1271kg) rated operation capacity) vertical lift skid steer loaders incorporate our unique single boom and side entry design. Designed for comfort, safety, economy, productivity and durability in the USA (home of skid steers), the 280’s 74hp (55kW) JCB EcoMAX engine is durable and hugely efficient. The 280 has on average 60% better visibility and a 33% larger cab than rival manufacturers’ skid steer loaders, and there are a whole host of other benefits too. Like ergonomic controls, an extremely tough powerful boom and a low cost of ownership. Keeping your operators fresh, focused and productive is paramount, which is why we’ve designed our 280 model of skid steer loaders with a 33% larger cab than the nearest competitive machine. Our standard seat has mechanical suspension and there’s also a 12V charger, easily readable control panels and an electronic hand throttle. 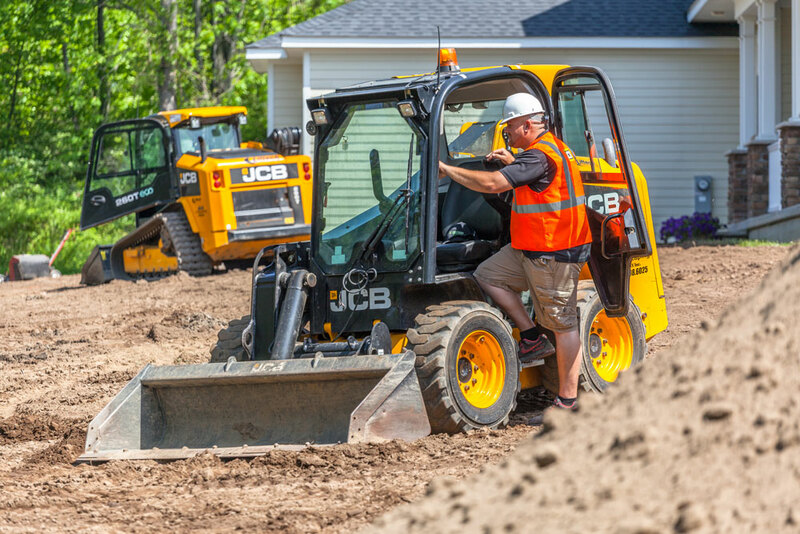 Servo-assisted controls make handling smooth and intuitive; all in all, we like to think that JCB 280 skid steers are a comfortable favorite with operators. There are no more productive skid steer loaders than the JCB 280. The figures speak for themselves: it has a 16% lower cost of ownership than the top competitor, a better SAE service rating, an annual fuel savings of over 3975 liters* and a heavy-duty crowd ram that’s nearly 3 times the size of the nearest major competition. JCB 280 skid steer loaders are designed with safety to the fore. Our unique PowerBoom single loader arm design means operators can enter the machine from the side, avoiding slip hazards, crush hazards and contact with the loader arm and its attachments. Large platform JCB 300 3000lb ((1360kg) rated operating capacity) vertical lift skid steer loaders incorporate our unique single boom and side entry design. Designed for comfort, safety, economy, productivity and durability in the USA (home of skid steers), the 300’s 74hp (55kW) JCB EcoMAX engine is powerful, durable and hugely efficient. Servo-assisted controls make handling smooth and intuitive; all in all, we like to think that JCB 300 skid steers are a comfortable favorite with operators. There are no more productive skid steer loaders than the JCB 300. The figures speak for themselves: it has a 16% lower cost of ownership than the top competitor, a better SAE service rating, an annual fuel savings of over 1050 gal (3975 liters)* and a heavy-duty crowd ram that’s nearly 3 times the size of the nearest major competition. JCB 300 skid steer loaders are designed with safety to the fore. Our unique PowerBoom single loader arm design means operators can enter the machine from the side, avoiding slip hazards, crush hazards and contact with the loader arm and its attachments. Large platform JCB 330 (3295lb (1497kg) rated operating capacity) vertical lift skid steer loaders incorporate our unique single boom and side entry design. They’re also the biggest skid steers we make. Designed for comfort, safety, economy, productivity and durability in the USA (home of skid steer loaders), the 330’s 74hp (55kW) JCB EcoMAX engine is powerful, durable and hugely efficient. There are no more productive skid steer loaders than the JCB 330. The figures speak for themselves: it has a 16% lower cost of ownership than the top competitor, a better SAE service rating, an annual fuel savings of over 1050 gal (3975 liters)* and a heavy-duty crowd ram that’s nearly 3 times the size of the nearest major competition. JCB 330 skid steer loaders are designed with safety to the fore. Our unique PowerBoom single loader arm design means operators can enter the machine from the side, avoiding slip hazards, crush hazards and contact with the loader arm and its attachments.